JFD's bell survival kit is for use in diving bells, hyperbaric lifeboats and underwater welding habitats in the event of a 'lost bell' or emergency situation. It provides a 'safe haven' for the diver offering thermal protection and gas conditioning. Most major international diving contractors have installed the JFD bell survival kit to their dive systems. 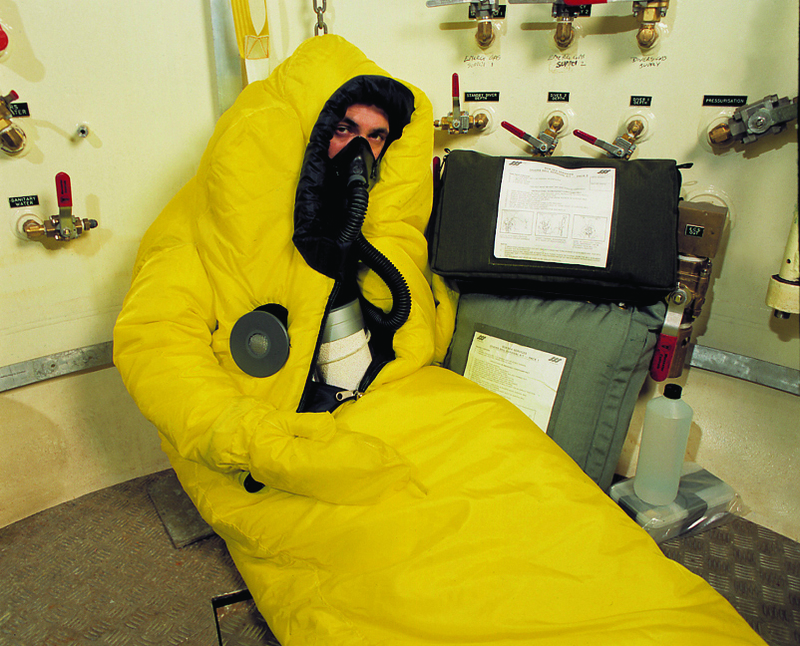 The diver's insulation system consists of a special survival bag and thick undersuit, both designed and tested for use in helium environments. This is a one-piece bodysuit complete with hood that the diver has as his first layer of thermal protection. It uses multi-layer advanced trispace insulation material sandwiched between pertex inner lining, to draw moisture away from the skin, and outer splash proof cover. A towel is also included. It is designed with long support straps that penetrate the rear of the bag at neck level, which can be attached to a suitable securing point. This will then support the diver in an upright sitting position even when asleep or possibly unconscious, and thereby prevent the diver falling across the access door to the bell and hindering rescue. The harness has two D-rings on the chest to which the CO2 scrubber unit is attached by way of small snap hooks. This relieves the oral nasal of any strain, and eliminates weight on the diver's neck or head. 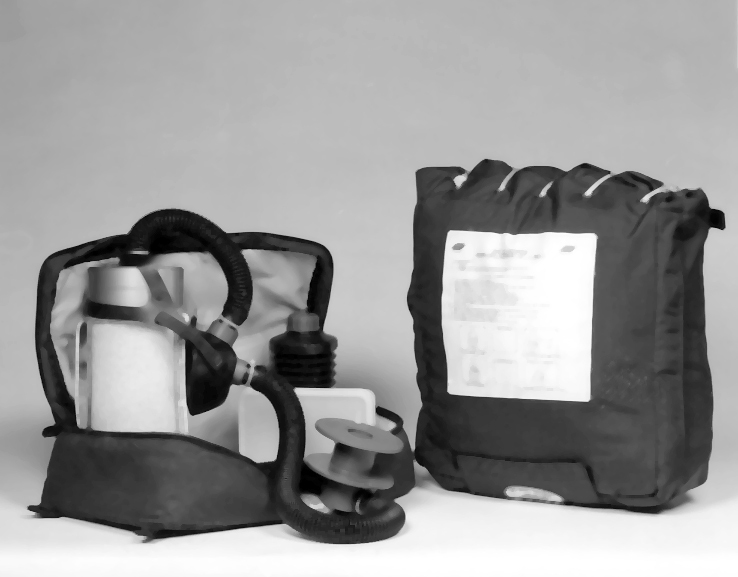 The survival bag also features an orally inflatable cushion for the diver to sit on to help reduce heat conduction directly away from the diver, as this is obviously where the insulation layers will be crushed by the diver's weight and would be less effective. Storage pouches inside the bag in which the water bottle, ration pack and sanitary bags can be stored once the diver is in the suit or bag. This eliminates the need for the diver to unzip the system and lose valuable heat. The 'arms' permit the diver to perform basic functions within the bell without leaving the sanctuary of the suit. They can be withdrawn in to the suit to further preserve heat. On the right chest is an expandable hole through which the thermal regenerator collar is pushed to aid gas circulation through the scrubber system. The whole system is vacuum packed and contained within a strong satchel/bag, which features four hanging loops to give multi-storage options. This pack contains a carbon dioxide scrubber/thermal re-generator assembly, a ration and water pack and sanitary bags. The system contains a passive, lung power CO2 scrubber unit and thermal re-generator system. Exhaled gases are passed through the CO2 scrubber to the thermal re-generator fitted into the survival bag wall. Fresh gas is taken from the bell environment through the thermal re-generator to the oral nasal. Dead space is reduced to 0.05 litre. The thermal re-generator was designed by Robert Gordon's Institute of Technology to give 95% heat recovery in a helium environment at 300m depth. The CO scrubber holds a 2.5 kg charge of MP 797 sodalime. For use within a hyperbaric lifeboat or rescue chamber. This pack contains the hardware from the standard pack 2 minus the rations. It is contained within a satchel which contains foam protection. This material has been shown to have a higher scrubbing efficiency than conventional absorbents. The canisters includes a dump valve prior to the re-generator to regulate return gas temperature. The oral nasal has been selected for comfort and efficiency. It has a pneu seal and a split band head strap. By containing the scrubber/regenerator within the insulated survival bag eliminates immediate contact of this unit with the colder bell gas. As the carbon dioxide is 'scrubbed' from the diver's exhaled gas within the sodalime canisters, heat is created by this chemical reaction thereby warming the gas. The heat contained within the diver's exhaled gas plus the heat gained from the chemical reaction in point 2, above, is transferred to the thermal regenerator and then given up by the thermal regenerator as the next inspired breath is taken in from the atmosphere. To ensure the energy balance is maintained, a supply of drinking water to counter dehydration and a supply of sanitary bags. All the equipment and rations are contained in a strong foam padded satchel fitted with webbing loops for attaching within the bell or habitat. JFD do not recommend the use of larger granule size sodalime. Testing has shown that the gas 'flow' paths are often created through larger and less homogeneous chemical. Note: These systems must be properly inspected and maintained. Courses are available in usage and maintenance by contacting JFD. A minimum six-monthly inspection/servicing interval is recommended. The bell survival pack servicing course has been created to provide candidates with the skills and knowledge required to correctly maintain and service a bell survival pack.